Enjoy lakes, mountains, and Midnight Sun while riding Cooper Landing and the Chugach National Forest on the Kenai Peninsula. The pristine waters of Kenai Lake lap the Shoreline Trail. If you’re looking for an off the grid, stunning adventure next summer, head about 100 miles south of Anchorage to Cooper Landing on Alaska’s Kenai Peninsula. In addition to extreme terrain and the possibility of a bear encounter, in July, riders are blessed with almost 24 hours of sunlight, meaning you can combine dramatic scenery with riding under the midnight sun. 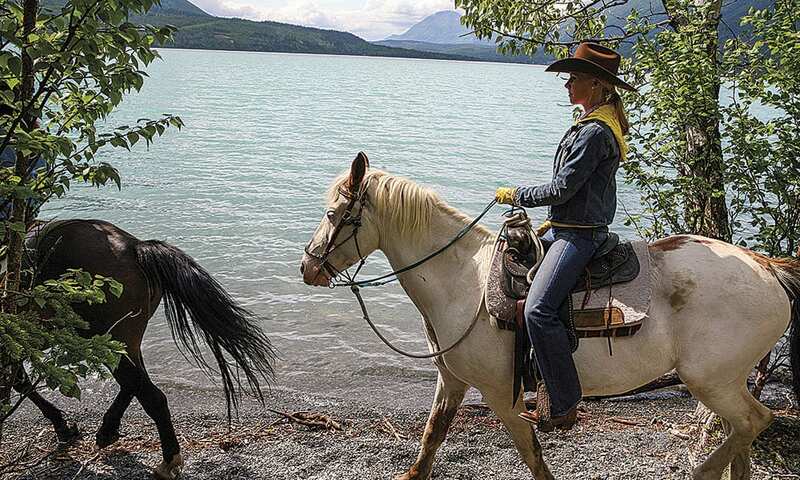 Time was certainly on my side as I rode a Paint horse, aptly named Harley, alongside a modern highway towards Kenai Lake. Local guide Michelle Donahue from Alaska Horsemen Trail Adventures led me along the lakeshore, where the most amazing milky turquoise waters lapped against a small beach. Standing on a small stretch of land, I gazed across the glassy, gem-colored waters to jagged, snow covered peaks, rising steeply to the sky. A popular fishing spot for lake trout, rainbow trout, and Dolly Varden, a type of char, Kenai Lake is one of the largest glacial lakes in the Kenai River System. 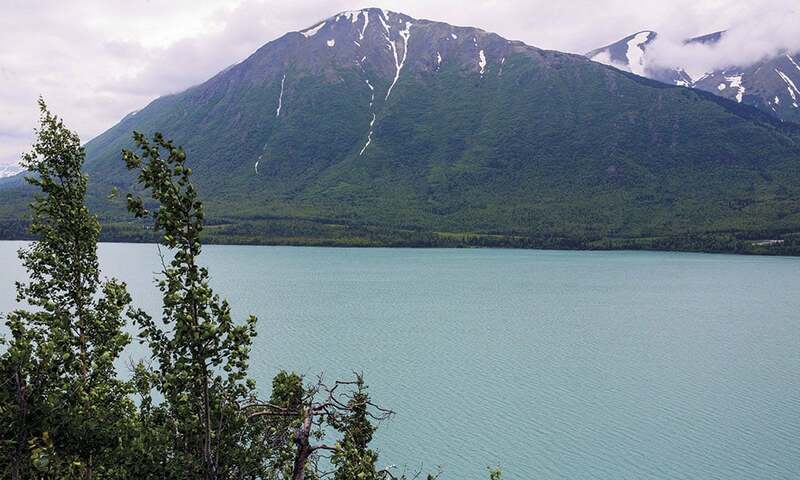 While many areas of Alaska are inaccessible, Kenai Lake does have road access, nearby lodges, B&Bs, and camping areas, making it a popular destination for travelers seeking to enjoy rivers, lakes, streams, mountains, glaciers, and outdoor adventures. Michelle and I continued our trek, ascending trails through the Chugach National Forest along the Russian Gap Trail, a historic route that gold seekers from Russia traversed in the 1850s. Comparable in size to the state of New Hampshire, the Chugach National Forest is the second largest national forest in the United States. Like everything else in Alaska, it is big. With a large population of bald eagles and also mountain goats, moose, Dall sheep, black bears, and grizzly bears, the variety of wildlife is outstanding. We continued to climb up towards a spot with views of the Russian Gap. During the 19th century, gold prospectors, including the area’s namesake Joseph Cooper, who discovered gold here in 1884, came to this area hoping to strike it rich. Russian prospectors had found gold back in 1848. By 1896, the Kenai Peninsula was a hot spot for gold seekers, many from the American West and Canada. Darley Newman and her trusty steed. Gold drew people here long ago, and the potential for luster still causes people to venture to this area. While I wasn’t looking for gold on my ride, I did see pretty wildflowers and a bear, thankfully far in the distance. As we rested at a lookout point, Michelle told me more about the modern prospectors that descend upon Cooper Landing. While there are some serious seekers, many tourists also partake in gold panning adventures mostly for the thrill of the hunt. Riding through the forest, we climbed up uneven terrain, getting further and further away from civilization and seeing more of this area of alpine tundra. Harley was super agile, making it easy to turn on some of the more narrow trails, where you have to watch your legs when going around the spindly trees. I stuck out my hand to ease us around one and could feel sections where the bark was missing. Michelle said that in the winter, when food was scarce, moose would sometimes strip the bark off the trees. 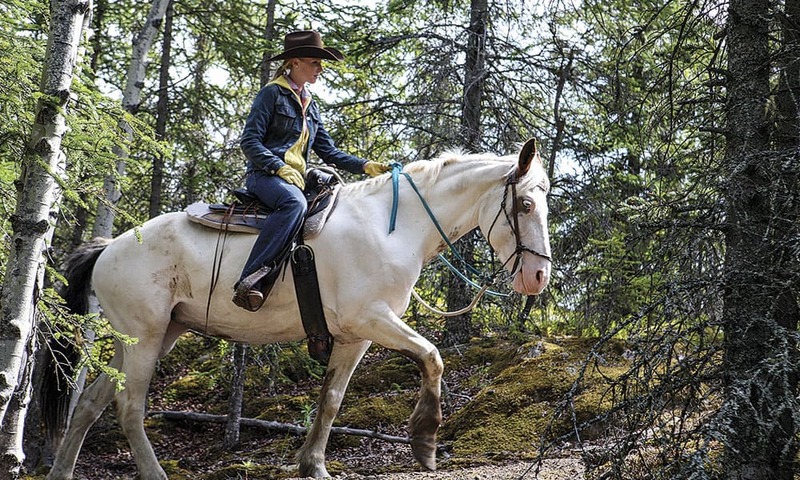 It made me think about how harsh life would be here in the winter both for residents and animals alike, but how wonderful and beautiful it was for us in the heart of summer—a true joy to experience on horseback. 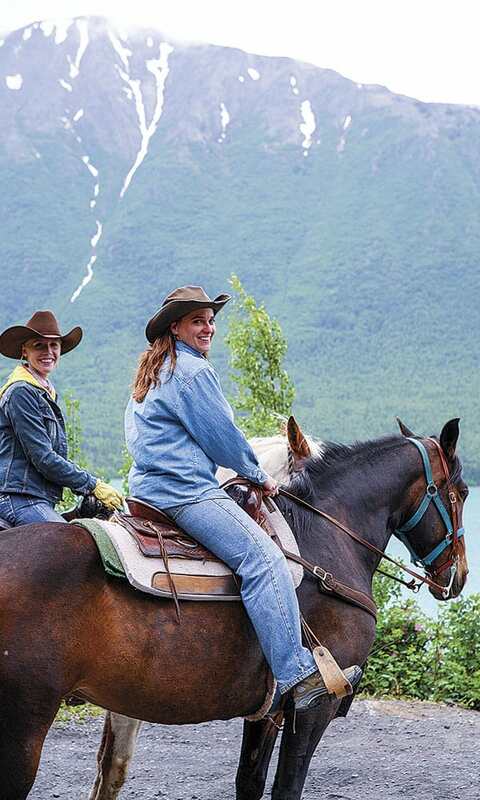 Darley Newman and Michelle Donahue of Alaska Horseman Adventures stop to enjoy the view along the Russian Gap Trail. We reached a high area facing a sheer rock wall and then miles of lush green forest—the infamous Russian Gap. There were two lone homes in the distance, with nothing else but mountains and trees. It’s this quintessential wild view that people come to Alaska to experience, to be at one with nature and take in the vast beauty that can only be found when you ride off the grid. (Originally published in the October/November 2016 issue of Cowgirl Magazine).